Medium 32 inch speed rail the perfect solution in any bar for organising and storing bottles. This speed rail is made from stainless steel so it will not rust within damp conditions. 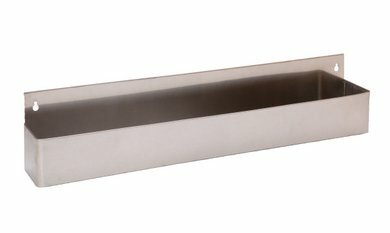 With wall mounts on both ends, this item can be taken on and off for easy cleaning, which also features rounded edges so your staff will not hurt themselves if they ever catch the corners. Dimensions 155(H) x 108(W) x 817(D)mm. Perfect for organising and storing bottles. Easy to take on and off. Well dimensions: 155(h) x 108(w) x 817(d)mm.